The violence in Iraq's Anbar province today rivals the deadly days of the 2006–2007 insurgency. Iraqi security personnel carry the coffin of a soldier killed during clashes in Ramadi in December 2013. Iraqi government forces have repeatedly shelled a hospital and barrel bombed residential areas in Fallujah, as part of an intensifying battle to seize control from armed militias in the country's volatile western Anbar province, Human Rights Watch said in a report published Tuesday. 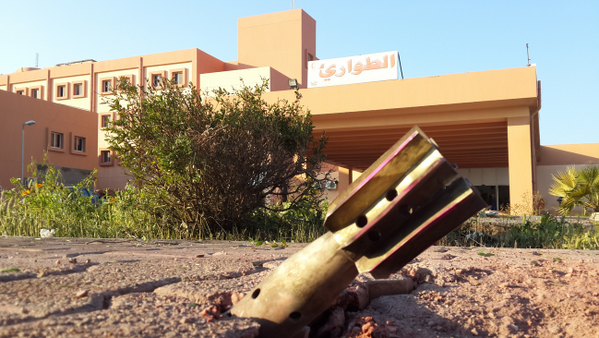 The repeated strikes on Fallujah General Hospital since May "strongly suggest" that the Iraqi government targeted it, which would violate international laws of war, the HRW report said. The Iraqi government has repeatedly denied allegations that it has used barrel bombs and targeted the Fallujah hospital. The HRW report also documented repeated attacks on civilians and soldiers by the Islamic State of Iraq and Syria (ISIS), the ultra-violent extremist group in western Iraq and Syria, which has used kidnappings, car bombings, and beheadings to terrorize civilians and combat government forces. HRW reported that ISIS's crimes "probably amount to" crimes against humanity. "This reckless disregard for civilians is deadly for people caught between government forces and opposition groups," Fred Abrahams, special adviser at Human Rights Watch, said in a statement. HRW's Iraq researcher Erin Evers told AFP that, while noting that rebels had confessed to several attacks, more responsibility lay with the government. "[T]o equate them with the crimes of a government that has rescinded responsibility for protecting its civilian population and ... rescinded responsibility for respecting its own laws and international law, there is no way the two can be equated," Evers said. The current crisis in Anbar province, which borders Syria, erupted in December after Iraqi security forces violently disrupted a controversial Sunni-led protest camp against the central government. At the start of January, ISIS and other armed militant groups then seized key parts of Ramadi and Fallujah in Anbar, the center of the bloody Sunni insurgency against U.S. forces in 2004. In the months since, militants have retained control of Fallujah, and continued to battle over Ramadi. The fighting in Anbar has displaced over 70,000 families since January, according to government figures. Since May, the fighting has displaced at least 5,000 families, according to figures from the United Nation, though other sources have put the number at at least 10,000, HRW reported. Since January, the Iraqi government has made it difficult for civilians to leave the region, and for humanitarian aid to enter and reach those in need. Meanwhile, the largely open border has allowed the near-free flow of ISIS fighters and arms between Iraq and Syria. Militants in Anbar have also seized on local grievances with government failures to stem widespread corruption, security voids, and sectarian favoritism that make the daily life of Iraqis a continual struggle. Islamic State of Iraq and the Levant (ISIL) celebrate in March on vehicles taken from Iraqi security forces on a main street in Fallujah. Also on Tuesday, a wave of attacks across Iraq killed at least 27 people. Iraq has witnessed a worrying resurgence in violence in recent months, the worst bloodshed since the height of the country's sectarian violence in 2006 and 2007. So far in 2014, fighting has killed more than 3,500 Iraqis. In April, Iraqis voted in the first parliamentary elections since the 2011 withdrawal of U.S. troops. Embattled Prime Minister Nuri al-Maliki won a majority of seats, as expected, though analysts warned that widespread disappointment with his failure to stem militia violence in Anbar, and across Iraq, will likely continue to erode his control.